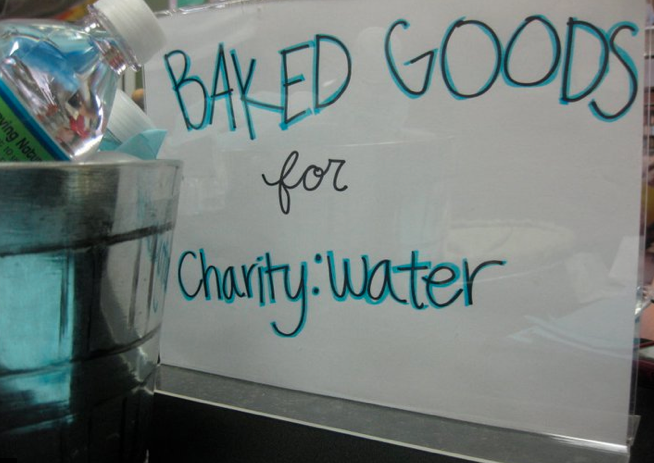 For my social media class (the same one that I started this blog for) we are doing a project where we have the goal of raising $5,000 for charity: water in a month. This incredible organization raises money to fund clean water projects in developing countries. One well costs $5,000, hence our goal. You can see an example of a live drill here. 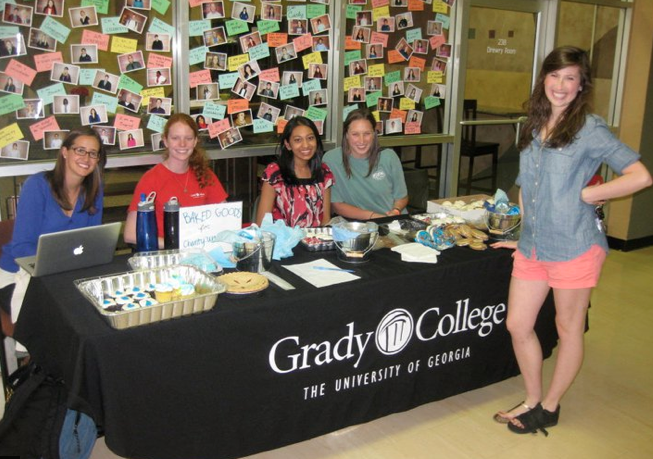 To kick off the project, we decided to host a bake sale complete with many water themed goodies. The night before the bake sale, a roommate of mine knew that I had a bake sale the next day and decided to surprise me by making the cookies for me. I could not have asked for a better treat or more helpful gesture on a stressful night. 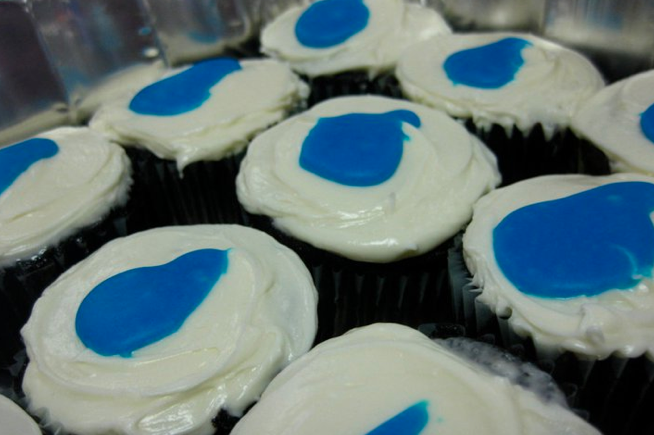 I also loved finding out that a another classmate’s friend also helped her with blue rice krispie treats. What great friends we have! Anyway, the great thing is, is that the treats were a huge hit! We ended up raising approximately $180 over the course of two days for our “Is yours clean?” campaign. Here are some of our delicious goodies courtesy of Sarah Varner from Bun Voyage. And finally, a few of the lovely ladies of #5990H. We would greatly appreciate any bit of donation you would like to give. To donate, check out our My Charity Water page. Remember: $20 can give one person clean water for 20 years. Any little bit helps! Feels so good that I could make someone’s day just with a little thing like that! And check out her blog to see some truly uplifting and encouraging stuff. It will make you smile. Guaranteed. Sometimes when I am reminded how much I miss someone or love someone, it is nice to send a card “just because.” However, every once in a while, it needs to happen quickly or I don’t have a stamp, so it can be tough. That’s where free e-cards come into play! While there are many websites online that allow you to send e-cards to friends and family, it’s nice to know that you can do it for free any time of the day with 123 Greetings. For example: try sending an e-card to your friend to tell them you’re thinking about them. Or your mom and dad to tell them thanks for always being there. Or to your kids to tell them you love them. A little encouragement can go a long way. 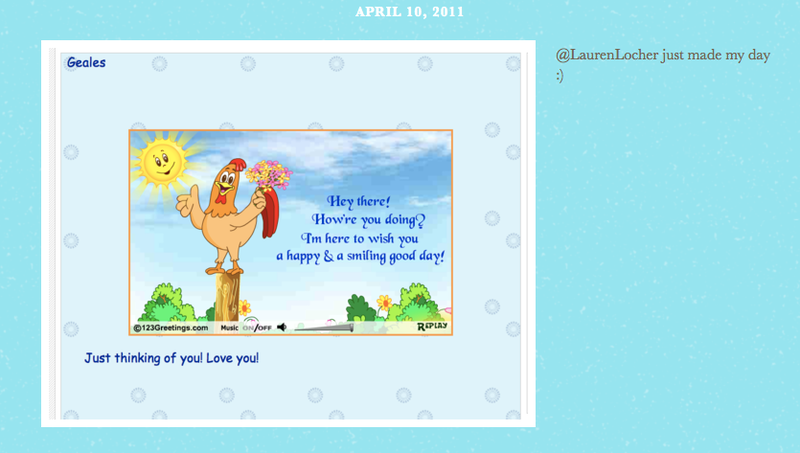 Today’s choice of card… one with a funny little rooster telling a friend to have a happy day! Just what she needs. And remember… they are free, so you can send as many as you want! 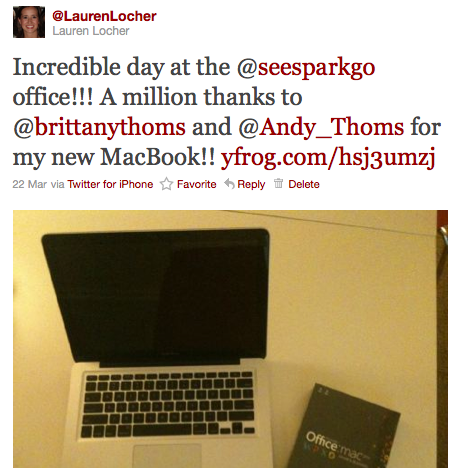 This blog coming from: my new MacBook Pro! Way to make my life, See.Spark.Go. Never have I felt so encouraged from a gift. Who knew that was possible? A total surprise (and absolutely needed). I am loving every bit of my new computer. This is just one of those times that I remember how blessed I am for the people in my life and all that God provides. Pretty cool. Too bad I wasn't "unbelievably" blessed with supernatural spellcheck skills. We can blame it on my excitement for the day. Now that I have had a chance to show off my new gadget, have y’all ever experienced something similar where you were overwhelmed by someone’s generosity? Spread the joy and tell us here! First thing that comes to my mind about Random Acts of Kindness… the movie Pay It Forward. Where Haley Joel Osment takes on the challenge to change the world by paying forward a favor to three people, rather than back to one. Ever since that movie I have always been a huge proponent of Random Acts of Kindness, or RAKs for short. They make the person’s day and ultimately make your day for making someone else’s day (as I make you confused with all of this “making”). All in all, that’s a win/win! There is an organization called the “Random Acts of Kindness Foundation” where people can share their stories about RAKs and also get ideas of RAKs for other people. As I was looking through them, I realized how often I witness RAKs or benefit from them. On Monday, I woke up in the middle of the night very nauseous and with a horrible sore throat. I also had awful dreams, so needless to say, I didn’t get a whole lot of good sleep. After class, I left immediately for work. When I arrived, there was a little surprise on my desk! 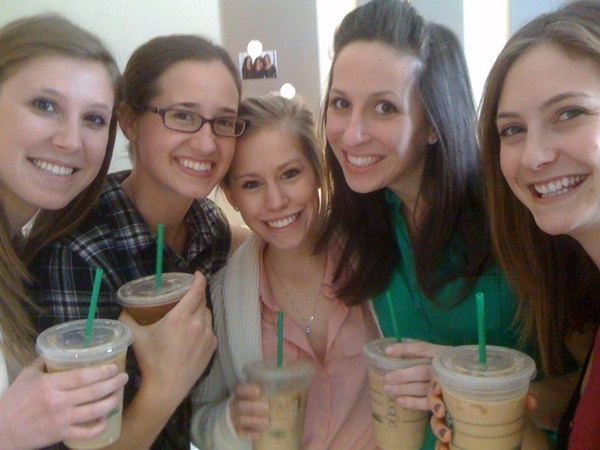 My boss, Brittany, brought everyone in the office a Starbucks Iced Caramel Macchiato! I had never had one before and if you haven’t either, let me just tell you: it was divine. Running on no sleep and having a rough day, there was nothing better than being reminded that someone was thinking of me. Just what I needed! Photo courtesy of Jessica Henry's mad iPhone picture-taking skills. It reminded me of how much fun it is to be the receiver (and the giver) of RAKs. I absolutely love to surprise people with little gifts or notes when they least expect it. I think my favorite RAK is probably the easiest of all time… receiving a nice “hello” or a smile from someone who I don’t know. Kind of like when people don’t even realize they are doing anything for me by having a huge smile while they walk through campus. But, you know what they say: smiling is contagious! It makes me want to be intentional with “paying it forward” by passing on the RAK to someone who needs it. You never know who really needs a good smile on their face that day. I’m making a list of people to pay it forward to, but I’m open to suggestions! What are the best RAKs you have ever received? Or given for that matter?